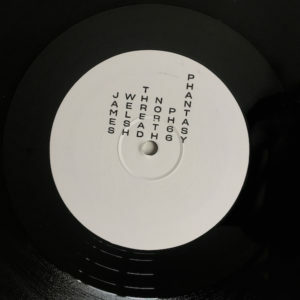 Fresh off the underground success of ‘Standing/Slip’, a club-ready bullet that received support from DJs such as Leftfield, Scuba and Adam Beyer, James Welsh returns to Phantasy post haste, once again blending a slab of characteristic rave euphoria with a more downtempo trip on the flip. The release opens on ‘Thread’, the unmistakeable sound of Welsh pushing his studio to its unworldly limits. Initially building the tension with competing, spectral components, an ominous intro paves the way for the sudden eruption of a stomping, hi-NRG electro bassline. Pathologically chaotic until it’s final moments, sudden breakdowns of white noise and ghostly commands lost deep in the mix anchor the listener in reality, enveloped in smoke and strobes, real or imagined. On the contrary, ‘North’ stretches a skeletal half-step beat to support a bracing vision of maximalist melancholy. A chilly analogue hymn, awash in choral reverb, heavenly organ sounds coalesce with cathartic distortion, creating a six-minute musical landscape that is at once pleasingly epic, yet tellingly intimate in its more subtle details. Physical and cerebral in equal measure, ‘Thread/North’ is a worthy contribution to Welsh’s increasingly powerful back catalogue.